Mabile Francine Ferreira Silva1, Maria Claudia Cunha2, Paulo Roberto Lazarini3, Marina Lang Fouquet4. facial paralysis, Bell paralysis, case studies, psychosocial impact. Introduction: The peripheral facial paralysis (PFP) results from the reduction or interruption of the axonal transport to the seventh cranial nerve resulting in complete or partial paralysis of the facial movements. The facial deformity and limitation of movements, besides affecting the aesthetics and functionality, can significantly interfere with interpersonal communication. 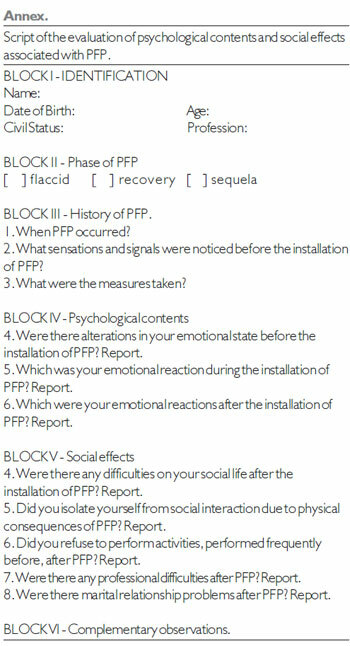 Objective: Investigate the psychological contents and other social effects associated to PFP in adult subjects, performing a comparative analysis in three groups of subjects with PFP: at flaccid, recovery and sequel phases. Method: Quantitative and qualitative research. 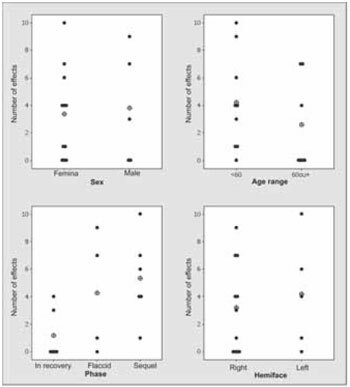 16 adult subjects, from both sexes, aging between 43 and 88 years old, with PFP. Procedure: Open interviews with subjects. The material was recorded in audio and video, literally transcribed, systematized through categorical and statistical analysis. Results: The subjects bearing sequels presented higher statistical significance of psychological contents and social effects associated to PFP. Followed, respectively, by those that were on flaccid and recovery phases. The results suggest that the speech-language therapist, besides performing functional and aesthetical rehabilitation with the subject with PFP, needs to be aware of psychological and social aspects that may be involved, in order to evaluate and seek to reduce the degree of psychological distress and promote the social adjustment of these patients. Conclusion: The biopsychosocial approach to patients with PFP revealed a wide and significant range of subjective contents that warrant new studies that may contribute to the effectiveness of the speech-language clinical method to approach this medical condition. The non-verbal communication, frequently expressed through the face, has important subjective function (1), and is an essential element to the development of the eastern individual, because, while traces and facial expressions are involved in the communication and socialization process, they are essential for the individualization, revealing the interiority and the feelings of each person (2). Considering the communicative importance addressed to the face, it is interesting to discuss the limitations and consequences that the peripheral facial paralysis (PFP) causes in the life of an individual who suffers this condition. In organic terms, the PFP results from the reduction or interruption of the axonal transport to the VII cranial nerve resulting in complete or partial paralysis of the facial movements. The facial nerve is frequently the most affected of the human body (3). It runs a osseous path of approximately 35mm and is thus vulnerable to the action of compressive and infectious processes of various kinds that can interrupt its nervous influx, leading to a complete blockage of its functions (4). Alterations may occur in speech, chewing, swallowing, tasting, salivation and tearing, hyperacusis and hypoesthesia in the external auditory canal (5, 6, 7, 8). Aesthetically, the disharmony between the facial movements and the speech is embarrassing, not only for the affected individuals but also for those around them (1). Therefore, this condition causes functional and aesthetical disorders important for the individual (9). Regarding etiology, several studies show that Bell Paralysis, or idiopathic, is the most common diagnosis, reaching half the cases (10, 11), and is a diagnosis based on the absence of serological test for infections, trauma, tumors and/or herpes zoster (12, 13). The recovering time of PFP is undetermined, a total or partial regeneration of the facial movements is possible, depending on the degree of the lesion of the facial nerve, of its various etiologies, the patient's age and how the case was conducted by the health professionals involved (14). In its initial phase, the PFP is called flaccid, and are observed: flaccidity of the muscles at rest and hypofunction of the movements, with partial or total incapacity to perform mimes and sphincter movements of the face (15). With the regeneration of the facial nerve, there is a possibility of recovery of the facial movements (16), occurring a gradual return of the movements, which can evolve to the total recovery of the facial movements and expressions, without sequelae (15). However, when this regeneration is partial, there may be found sequelae, such as: synkinesis, post-paralytic hemifacial spasm and/or persistence of motor deficit with muscle contractures (17, 18). Another characteristics of the sequelae can be the remaining of the hypofunction of the affected facial muscles, typical of the flaccid phase of PFP (19). The facial deformity and involuntary and undesired movements, common after the establishment of the sequelae, besides damaging the aesthetics and functionality, can significantly interfere in the interpersonal communication. Such condition limits the expressiveness of the individual, causing a variety of psychosocial problems such as depression, anxiety, rejection and paranoia (20). In the rehabilitation in cases of PFP, traditionally, the phonoaudiologist develops a work focused on the stomatognathic system, based on the investigation of the damages caused on the facial muscles by the lesion of the facial nerve. This approach evaluates the functions related to these muscles, intervening with the purpose of promoting the recovery of the functional and aesthetical aspects. However, it is desirable that the psychological and social aspects associated with this clinical condition are not neglected (21). After these considerations we can observe, in short, that the difficulties to use the facial movements, besides the changes in speech, cause suffering to the individual; often causing physical, psychological and social associated disorders (21). From the exposed, this study focuses in PFP under the point of view of the subjects who suffer with its consequences and, in this perspective, aims to contribute to the effectiveness of the clinical phonoaudiological method. Considering these aspects, this study has as main objective: to investigate the psychological contents and the social effects associated to PFP in adult subjects, and as specific objective: to compare these data in three groups of patients, namely, in flaccid, recovery and sequela phases. Nature of the research: quantitative and qualitative clinical research, developed through case studies. Casuistry: 16 adult subjects with PFP, 4 in flaccid phase, 6 in recovery phase and 6 in sequela phase. -There were selected subjects being treated in the Phonoaudiology sector of the Institution in which the research was performed. -Adults, of both sexes, above 18 years of age; since the occurrence of PFP in the pediatric population (1-15 years) is three times smaller than the found in the adult population (22). -PFP was of unknown origin or idiopathic, since most of the cases did not present other associated diseases (11). -PFP phase was determined from the realization of the otorhinolaryngological and phonoaudiological evaluations. Besides, was considered the time of installation of PFP and the observation of clinical signs which indicated the stagnation, evolution or installation of sequelae. -These subjects manifested moderate deformity (III), grave moderate dysfunction (IV) and grave dysfunction (V), according to the evaluation scale of HOUSE & BRACKMANN (23) which begins in degree I and goes to degree VI. -The evaluation of the facial movements was based on the protocol used in the Phonoaudiological Rehabilitation Sector of the institution where the research was performed (24). -PFP should not be associated to other diseases or traumatic lesions, in order to not be considered as a secondary symptom. Stage 1: Personal data (age, gender, profession and complaints), as well as medical history, installation of PFP, previous exams, diagnostics and therapeutic conduction, were brought up on the medical records of the patients in treatment. Stage 2: The functional condition of the face was classified on phases flaccid, recovery and sequela, following the protocol used by the Institution and described on the casuistry, therefore confirming the subjects' PFP condition. At the evaluation of the mobility of facial muscles was asked that each movement be executed 5 times, for better accuracy of the quotation in one of five degrees (0 - contraction not visible to the naked eye nor to the oblique light; to 4 - the movement is executed widely, with synchrony and symmetry, in relation to the healthy side) (24). Stage 3: The interviews were open, individual, with average length of 50 minutes and aiming to let the subjects express themselves freely, especially regarding subjective aspects of PFP, from the following question: What were the consequences of PFP on your social and emotional life? When necessary, the researcher intervened during the interview, focusing on the objective of the research. They also sought to encourage the spontaneous report from the patient, without coaching, aiming to detect the manifestations of the mental function in its verbal and non-verbal dimensions (25). The assessment of the functional condition of the subjects was photographed and filmed, so there would be registration and proof. The interviews were recorded in audio and video and stored in DVD-ROM, so that they could later be fully transcribed in regular orthography and analyzed more rigorously. Phase 1: The interpretation of the material obtained in interviews was marked on the category analysis (26). From the investigation of what each element has in common with the others, the categories were organized and grouped. The structuring of this process depends on the isolation of the elements (inventory) and the organization of the messages (classification) (26). Phase 2: Description of the convergent and divergent categories among the statements of all subjects, through simple statistics. Phase 3: Comparison between the categories present on the group of patients on phase flaccid, recovery and sequela, through simple statistics. Phase 4: The material obtained in the interviews was analyzed from references from theoreticians of psychoanalysis (psychological contents), social psychology (Theory of Stigma) and phonoaudiology (symptomatological collection). The guide of evaluation of the psychological contentes and social effects associated to PFP was prepared from the results obtained in this research and is structured in thematic blocks, based on categorical analysis (26) of the contents of the interviews with the studied subjects. According to the proposed ethical standards for research using humans, participated on the research only those subjects who agreed to sign the "Term of Free and Informed Consent" (TFIC). The identity of the subjects was preserved; therefore, their names were replaced by numbers. The research was approved by the Committee of Ethics of the Institution, nº 251/09. The sample consisted of 16 patients who had PFP: 11 (68,7%) were female and 5 (31,3%) were male. 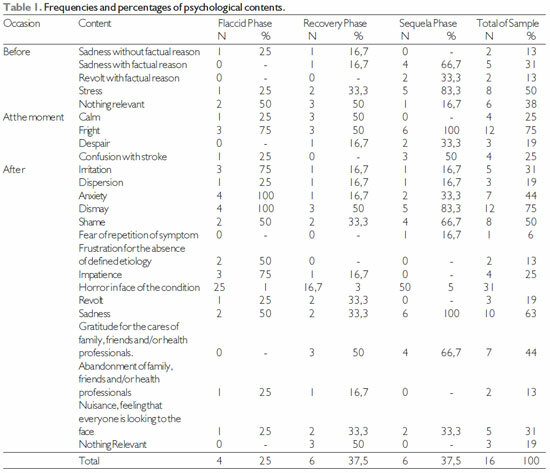 Table 1 shows the frequencies and general percentages and percentages for each phase of PFP in relation to the occurrence of each psychological content. The factors with highest frequency in the overall sample were fright at the moment of PFP and dismay after PFP, each reported by 12 (75%) patients. The factors with highest frequency in flaccid phase were anxiety, dismay after PFP, each reported by 4 (100%) patients. At recovery phase was observed a smaller frequency, reaching 50% for the contents: calm and fright at the moment of PFP; dismay, sadness and nothing relevant after PFP. Sequela phase presented the highest frequency of answers, with fright at the moment of PFP and sadness after PFP reported by 6 patients (100%) and stress before PFP, dismay reported by 5 (83,3%) patients. For each patient was calculated the number of psychological contents. Table 2 presents the observed values of the descriptive statistics for the number of psychological contents per patient, gender, age group, phase and hemiface. The values of the number of psychological contents observed in each patient are represented on Figure 1. Similar behavior is observed in both genders, that is, people of both sexes tend to present, in average, the same number of psychological contents: the elderly present, in average, lower number of contents than the youngest, the subjects in recovery present lower average of number of contents than those on the other phases, and those who have the right hemiface affected present lower average of number of contents than those who have the left face affected. In the analysis of the social effects were adopted the same procedures used on the psychological contents analysis. The frequencies and percentages of general occurrences and occurrences on each phase of PFP of social effects are presented on Table 3. The effects with most frequency are related to isolation. On flaccid phase the category isolation: avoids meeting people was reported by 3 patients, that is, 75% of the sample. The recovery phase presented frequency of answers below 40%, highlighting only isolation: avoids leaving the house, reported by 2 (33,3%) patients. Sequela phase stands out for presenting mostly frequencies of answer above 50% for the established categories, evidencing that the categories of isolation: avoids talking and meeting people, were reported by 5 (83,3%) patients. For each patient was calculated the number of social effects reported. Table 4 shows the observed values of descriptive statistics for the number of effects per patient, gender, age group, phase and hemiface. The values of number of social effects observed in each patient are represented on Figure 2. 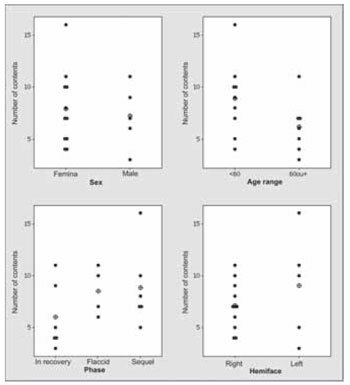 The number of social effects per patient does not depend on gender, and is, in average, lower in those with 60 or more years, having a higher average on those with left hemiface affected, and is higher, in average, on those with sequela. Regarding the gathering and characterization of the subjects, there is a prevalence of females (68,7%) in relation to males (31,3%). VALENÇA, VALENÇA and LIMA (18), had already pointed out the prevalence of women in their study, obtaining a similar percentage, 66,7% of the sample. GARANHANI, CAPELLI and RIBEIRO (27), in their study, also found this prevalence of women with PFP (60,8%). "So, it's like, my problem came from another problem. Because you see, I have a son and he is, it's that he started using drugs. When it was the same day my son decided to tell me, then when he told me, I froze." "I think it all came together. Problem of husband that drunk, then problem that my father died, next problem of my son, then I gathered all this, when I thought that I wasn't all crooked. Then that's it, until today, until today that I am, I ask God every day to give me patience, strength and courage to go on." (Subject 14 - Sequela Phase). As highlighted by ÁVILA (28), the symptoms shan't be minimize or dismissed, it is necessary an investigation of the personal life of the patient every time the etiology of a specific disease appears confuse or incomplete. Beyond that, it should be considered that the treatment consists in making the individual overcome the alienation that keeps him a stranger to himself, to make him admit himself as a subject, without establishing a relation of subordination and dependency between patient and health professional (29). LIPOWSKI (30) pointed out that in the somatization, precipitating factors include vital events and personally stressing situations, due to its subjective meaning of loss or threat to the individual. An important aspect of the personality of the patients is the one called trace of "neuroticism" and the vulnerability to stress (28). LIPOWSKI (30) also stresses that the tendency of these patients to deal with difficulties in life, their multiplicity in conflicts, through the adoption of a "sick role", with which they try to gain the support and attention of their family, as well as avoid social and familiar obligations. It is necessary to remember, that the patient, in this frail condition, needs to be welcomed and listened, taking in consideration the aspects that he associated with his disease process (28, 31). The research of REBELO, ROLIM and FERREIRA (32) reminds that the person initiates a course of inner suffering when sick, including emotions and feelings of deep discomfort, anxiety, impatience and sadness. "I cried a lot, I didn't sleep. It messed with my appetite, messed with my sleep, I cried because, regardless of us feeling terrible, ridiculous, ugly, it really messes with the nervous system, with me it messed a lot, a lot, a lot." (Subject 5 - Recovery Phase). This data agrees with the study of BYRNE (33) which points out the tendency of the depressive symptom (65%) in subjects with PFP. Facing these quotes it is interesting to stress that the process of educating the individual about what leads him to illness in the physical, mental and social spheres can provide the change of negative aspects that contribute to this state of disharmony. The discovery of stressing factors that influence in disease is fundamental to the occurrence of the changes that also refer to the awareness of patterns of behavior harmful to the person, both physical and emotional (34). Regarding the feeling of shame (50%) it is interesting to remember the work of SILVA and MÜLLER (34) about skin diseases, where the individual makes use of camouflage to hide the skin problems, or avoid the routine activities, for noticing the negative reaction of others, which provokes the feeling of shame. "It's like, you're used to your physiognomy and all of a sudden you see yourself crooked, the face deformed, understand? You laugh a lot and it looks like someone ripped your mouth and put it up. You know, it's devastating, devastating. It crashes our self-esteem, your ego goes right down, mine did. I felt terrible, didn't want to look into the mirror, you know. I was ashamed to eat in front of the others and smiling, no way." (Subject 5 - Recovery Phase). The fact that idiopathic PFP is not an organically severe affection makes us underestimate the condition, and that may be similar to the reported by SILVA and PAIS-RIBEIRO (35) in the condition of macular degenerescence, and may distance the relation between the patient and the health professional. "if you look at a person with facial paralysis, you don't imagine that it is a big deal, but it does. I would never imagine that it messed up so much with myself, understand, because of all the problems I've had with my health it was the one that messed with me the most, on the inside." (Subject 5 - Recovery Phase). One of the subjects claimed to avoid looking at his face in the mirror and it's noteworthy that it's been six (6) years that PFP has installed itself. "So, many times I don't even look at myself in the mirror, because every time I look I feel very sad." (Subject 14 - Sequela Phase). Analyzing what SANT'ANNA (36) affirmed about the subjective intentions revealed through the study of the face, it is important to highlight the psychological impact caused by a facial alteration as drastic as PFP. The difficulty to recognize onself and express through the face, brought the impossibility of subject 14 to look in the mirror. Closing this section, we can observe that the discussion was permeated with references of researches and literature that brought up subjective aspects of the history of the face and psychosomatic aspects involved in several pathologies. On the other hand, it was found a lack of specific references of researches about PFP, and the specific works on the theme presented general data relative to behavioral changes without explaining them after the installation of PFP. On this item were exposed the variety of strategies the stigmatized subjects employed to deal with the peer rejection and the complexity of types of information about themselves that they project on others, as established by GOFFMAN (37). "It's not that I hid that I... of course, I was worried, you know, I was worried because people deserve this care, this respect of our speech, of our face. Our face is everything. It's the image that goes everywhere." (Subject 16 - Recovery Phase). "Because I live (...) almost thirty five years, then we know everybody, the neighbors, everyone, even going out the street is kind of troubled, even have to put dark clothes, looks like a robber, looks like you're running from the. and like, because it is, let's assume, it's logical, you're a very polite person, someone will ask an you'll stop and answer, won't you?" (Subject 7 - Flaccid Phase). In this case, the individual that suffers with his stigma feels depotentiated to attend to certain places, because he assumes that the others, even though don't know him, will notice his difference (37). COULSON, O'DWYER, ADAMS and CROXSON (38) assessed the impact of PFP on the life quality of these individuals through open questionnaires, finding that the higher the damage of movements of the facial muscles, there is a considerable decrease of the social function, which is consistent with the results gathered in this research. "(...) I had my bear, listened to live music, danced over there. Outside, where there are the bars, stayed outside. I liked a lot to go, to listen the music and have fun and now I don't go anymore." (Subject 8 - Sequela Phase). "I don't take. I didn't take before becouse I was very shy, but I took and everything, not now. Never took again. See, if today I have to take a picture for a document, I won't take." (Subject 9 - Flaccid Phase). With this condition almost completely incapacitating of facial expression, even if the condition is of lesser expression of feelings, like in the case of 3x4 photos for documents, the subjects feels uncomfortable to register his face in pictures. With the muscular malleability it is possible to deduce the feelings of an individual only by paying attention to the facial expressions (39). With PFP it becomes hard to have this malleability. "the food fall from the mouth for everyone to see, you even lose the appetite. The appetite ends, you don't want to eat. I lost more than three kilos in four months and it ended me, I mean, of course I needed to lose weight anyway (laugh), but it was devastating. Water you can't drink anymore, you drink water, the water falls on your clothes and that's terrible." (Subject 5 - Recovery Phase). On GOFFMAN'S (37) considerations, for the stigmatized, society reduces the opportunities, efforts and movements, doesn't value, imposes loss of social identity and determines a deteriorated image, according to the model that suits the society. The different assumes a category of "harmful", "incapable", out of the parameter society takes as standard. He remains at the edge and has to answer to what society determines. The social tries to conserve the deteriorate image as a constant effort to maintain the effectiveness of the symbolic and hide what interests, which is the maintenance of the social control system (37). Figure 1. Individual and average values of the Number of psychological contentes per patient in each category of Gender, Age group, Hemiface and Phase : average. Figure 2. Individual and average values of the Number of social effects per patient in each category of Gender, Age group, Hemiface and Phase : average. The results indicate that, comparatively, the subjects with sequelae show greater statistically significance of psychological contents and social effects associated with PFP. Followed, respectively, by those on flaccid and recovery phases. However, mainly, the reports of the studied subjects revealed wide and significant range of subjective contents that must be investigated and incorporated by phonoaudiologists on the treatment of PFP, in order to promote greater effectiveness of the phonoaudiological clinical method. We suggest the continuity of researches about the theme with expanded casuistry and focus on the following strands: the listening to patients' treatment and the clinical implication of biopsychosocial approach of PFP. 1. Fouquet ML. Atuação fonoaudiológica nas paralisias faciais. In: Barros APB, Arakawa L, Tonini MD, Carvalho VA. Fonoaudiologia em Cancerologia. São Paulo: Comitê de Fonoaudiologia em Cancerologia; 2000, pp. 99-104. 2. Courtine JC, Claudine H. História do rosto: exprimir e calar as suas emoções (do século XVI ao início do século XIX). Lisboa: Editora Teorema, 1988. 3. Fernandes AMF, Lazarini PR. Anatomia do Nervo Facial. In: Lazarini PR, Fouquet ML. Paralisia Facial: Avaliação, Tratamento e Reabilitação. São Paulo: Lovise; 2006, pp. 1-10. 4. Bento RF. Doenças do Nervo Facial. In: Bento RF, Miniti A, Manore S. Tratado de Otologia. São Paulo: Edusp; 1998, pp. 427-429 Edusp. 5. Adams RD. Neurologia. Rio de Janeiro: McGraw-Hill; 1998. 6. Valença MM, Valença LPAA, Lima MCM. Nervo facial: aspectos anatômicos e semiológicos. Neurobiol. 1999, 62:77-84. 7. Vasconcelos BEC, Dias E, Dantas WRM, Barros ES, Monteiro GQ. M. Paralisia facial periférica traumática. Rev Cir Traumat Buço-Maxilo-Facial. 2001, 1:13-20. 8. Colli BO, Costa SS, Cruz OLM, Rollin GAFS, Zimmermann H. Fisiopatologia do nervo facial. In: Costa SS, Cruz OLM, Oliveira JAA. Otorrinolaringologia: Princípios e prática. Porto Alegre: Artes Médicas; 1994, pp. 193-203. 9. Zemlin WR. Princípios de Anatomia e Fisiologia em Fonoaudiologia. 4ª ed. ; Porto Alegre: Artmed, 2000. 10. Lazarini PR, Almeida R. Etiologia da Paralisia Facial Periférica. In: Lazarini PR, Fouquet ML. Paralisia facial: avaliação, tratamento e reabilitação. São Paulo: Lovise; 2006, pp. 81-108. 11. Portinho F. Paralisia de Bell. In: Campos AH, Costa HOO. Tratado de Otorrinolaringologia. São Paulo: Roca; 2002. 12. Hyden D, Roberg M, Forsberg P, Fridell E, Fryden A, Linde A, Odkvist L. Acute "Idiopathic" Peripheral Facial Palsy: Clinical, Serological, and Cerebrospinal Fluid Findings and Effects of Corticosteroids. Am J Otolaryngol. 1993, 14:166-79. 14. Irintchev A, Wernig A. Denervation and reinnervation of muscle: physiological effects. European archives of oto-rhino-laryngology: official journal of the European Federation of Oto-Rhino-Laryngological Societies (EUFOS) : affiliated with the German Society for Oto-Rhino-Laryngology - Head and Neck Surgery 1994:S28-30. 15. Fouquet ML, Serrano DMS, Abbud IE. Reabilitação fonoaudiológica na paralisia facial periférica: fases flácida e de recuperação do movimento. In: Lazarini PR, Fouquet ML. Paralisia facial: avaliação, tratamento e reabilitação. São Paulo: Lovise; 2006, pp 65-74. 16. Goffi-Gomez MVS, Bernardes DFF. Reabilitação miofuncional na paralisia facial. In: Costa SS, Cruz OLM, Oliveira JAA. Otorrinolaringologia: princípios e práticas. Porto Alegre: Artes Médicas: 2006. 17. Freitas KCS e Goffi-Gomez MVG. Grau de percepção e incômodo quanto à condição facial em indivíduos com paralisia facial periférica na fase de sequelas. Rev Soc Bras Fonoaudiol. 2008, 13(2):113-8. 18. Valença MM, Valença LPAA, Lima, MCM. Paralisia facial periférica idiopática de Bell: a propósito de 180 pacientes. Arq. Neuro-Psiquiatr. 2001, 59(3B):733-9. 19. Vanswearingen JM, Brach JS. Changes in facial movement and synkinesis with facial neuromuscular reeducation. Plast Reconstr Surg. 2003, 111(7):2370-5. 20. Diels HJ, Combs, D. Neuromuscular retraining for facial paralysis. Otolaryngol Clin North Am. 1997, 30(5):727-43. Review. 21. Devriese PP. Treatment os sequelae after paralysis: a global approach. J laryngol Otol. 1998, 112(5):429-431. 22. Rowlands S, Hooper R, Hughes R, Burney P. The epidemiology and treatment of Bell's palsy in the UK. Eur J Neurol. 2002, 9:63-7. 23. House JW, Brackman DE. Facial nerve grading system. Otoryngo Head Neck Surg. 1985, 93(2):146-7. 24. Lacôte M, Chevalier AM, Miranda A, Bleton JP, Stevenin P. Avaliação da função motora da face nas lesões periféricas e centrais. In: Lacôte M, Chevalier AM, Miranda A, Bleton JP, Stevenin P. Avaliação clínica da função muscular. São Paulo: Manole; 1987, pp. 13-24. 25. Volich RM. Psicossomática: de Hipócrates à psicanálise. 7ª Ed. São Paulo: Ca do Psicólogo, 2010. 26. Bardin L. Análise de conteúdo. 7ª Ed. São Paulo: Escuta, 2002. 27. Garanhani MR, Cardoso JR, Capelli AMG, Ribeiro MC. Fisioterapia na paralisia facial periférica: estudo retrospectivo. Rev Bras Otorrinolaringol. 2007, 73(1):112-5. 28. ÁVILA LA. O eu e o corpo. São Paulo: Escuta; 2004. 29. ÁVILA LA. Doenças do corpo e doenças da alma. São Paulo: Escuta; 1996. 30. Lipowski ZJ. Somatization: the concept and its clinical application. Am J Psychiatry. 1988, 145:11. 31. Dolto F. A imagem inconsciente do corpo. São Paulo: Ed. Perspectiva; 2002. 32. Rebelo V, Rolim CE, Ferreira S. Avaliação da qualidade de vida em mulheres com cancro da mama. Um estudo exploratório com 60 mulheres portuguesas. Psicol Saúde Doenças. 2007, 8(1):13-32. 33. Byrne PJ. Importance of facial expression in facial nerve rehabilitation. Current Opinion in Otolaryngol & Head and Neck Surgery. 2004, 12:332-335. 34. Silva JDT, Müller MC. Uma integração teórica entre psicossomática, stress e doenças crônicas de pele. Estud. Psicol. 2007, 24(2):247-256. 35. Silva I, Pais-Ribeiro J. Aspectos psicossociais e qualidade de vida da degenerescência macular relacionada com a idade. Psicol Saúde Doenças. 2006, 7(2):179-193. 37. Goffman E. Estigma: Notas sobre a manipulação da identidade deteriorada. 4ª Ed. Rio de Janeiro: LTC Editora; 1988. 38. Coulson SE, O'dwyer NJ, Adams RD, Croxson GR. Expression of emotion and quality of life after facial nerve paralysis. Otol Neurotol. 2004, 25(6):1014-9. 39. Maluf-Souza O. Fealdade e Anatomia: Sentidos instalados a partir de uma história do rosto. In: III ENALIHC - Encontro Nacional Linguagem, História e Cultura - é uma realização do CEPEL - Centro de Estudo e Pesquisa em Linguagem - da UNEMAT, 2009. 1) Master in Phonoaudiology by the Pontifícia Universidade Católica de São Paulo (PUCSP). Clinical Phonoaudiologist. 2) Full Professor of the Department of the Phonoaudiology Clinic of da College of Human and Health Sciences of Pontifícia Universidade Católica de São Paulo (PUCSP). 3) Professor Assistant of the College of Medical Sciences of Santa Casa de São Paulo. 4) Professor Master, responsible by the sector of Phonoaudiology of the Discipline of Head and Neck Surgery of Irmandade da Santa Casa de Misericórdia de São Paulo. Institution: Pontifícia Universidade Católica de São Paulo (PUCSP) Irmandade Santa Casa de Misericórdia de São Paulo - Faculdade de Ciências Médicas da Santa Casa de São Paulo. São Paulo / SP - Brazil. Mailling address: Mabile Francine Ferreira Silva - Rua Emilia Martins Rulo, 196 - Jd. Silvio Sampaio - Taboão da Serra / SP - Brazil - Zip Code: 06773-300 - Telephones: (+5511) 3722-4938/ (+55 11) 7303-0811 / (+55 11) 4138-2871. Article received in March 21st of 2011. Article approved in June 25th of 2011.